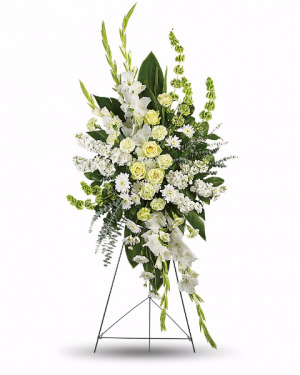 Pride, dignity, admiration and faith are on beautiful display in this moving sympathy arrangement. 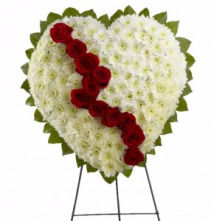 It's a meaningful way to deliver your heartfelt message. 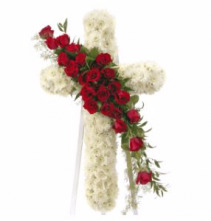 This thoughtful tribute of sympathy is hand arranged using red roses surrounded by white cushion pom pons. The Broken Heart is a beautiful way to express the impact that the departed had on your life. 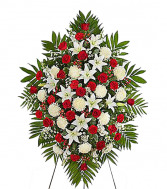 Pearly white chrysanthemums form the shape of a heart, accented with greens lined around the outside and "broken" in the middle with a line of rich red roses to create an exquisite way to honor the life of the deceased at their memorial service. Displayed on an easel. Funeral Flower Arrangements offer respects paid to the family and friends of a departede loved one. 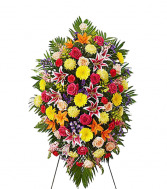 Sympathy bouquets express your condolences to the greiving family. 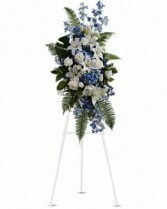 The serene nature of the sympathy arrangements provide a peace and calm aura that will help decorate the final moments. As you San Bernardino Flower Shop - Inland Bouquet Florist offers same day funeral flowers for our customers with less stress, less greif, and less worries. 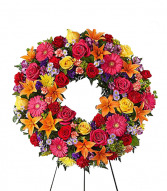 With over 25+ years of experience our goal is to provide an assortment of flower types of any flower color that will aide and assist in serenity of the funeral. Allow us to provide fresh flowers for the memorial funeral. The process will be as effortless as we can make it. 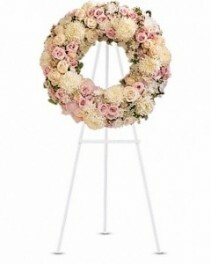 There are plenty of arrangements to be made. 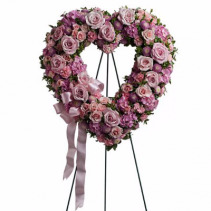 Give us a call or stop by our location in Inland to discuss memorial arrangements and have funeral flowers delivered in the Inland Empire today. 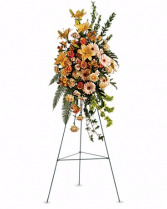 Standing Spray - More traditional and coordinated. The standing spray spreads floral across all sides of the center. 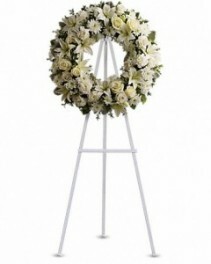 The All-White Standing Spray is the most popular for funerals as a tribute spray. Add red roses with a touch a blue to give an honorable service to a fallen soldier. 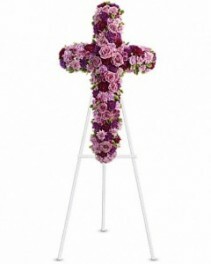 Standing Cross Spray - Ideal for Religious services. The cross embodies the meaning of God, peace, and love. 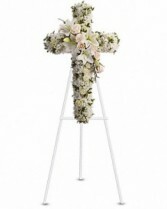 Standing Heart - Similar to the cross, the heart shaped wreath may come in open or closed style. Open means the center is hollow, closed means the full heart will be decorated in floral. 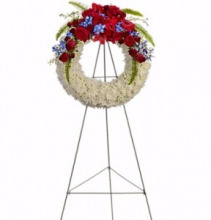 Standing Wreath - Circular, this wreath is the second most popular due to its balanced look. Browse our selection as we have carefully crafted the best options available from our experince. 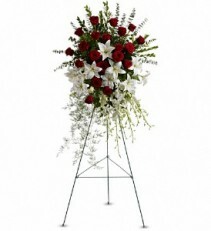 Each and Every standing spray is hand selected from our experienced florists to deliver peace, empathy, and compassion. Each is hand selected by the tops florists to display empathy and sympathy. 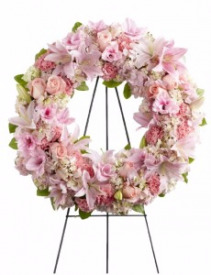 San Bernardino Local Florists Who Offer More Sympathy Flower Arrangements! 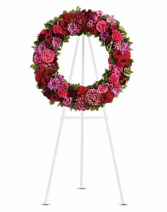 Funeral floral decor should not be limited to sprays on easels. The sign-in table can be addressed in many ways. The Peaceful White Lilies Basket graces the table with finesses and calm. 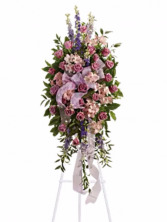 The casket often times look colorful with a beautiful casket spray. If the casket is closed you are permitted to use a full-couch casket piece. 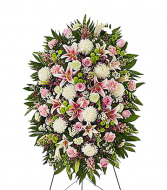 If the casket is open a half-couch casket spray will decorate the closed half for the funeral. We offer a lavish collection to express your condolences in a pleasant manner for any sympathy gift to the heartbroken. 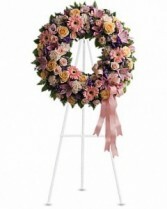 The rush of planning funeral arrangements is enough to rail anyone off track. 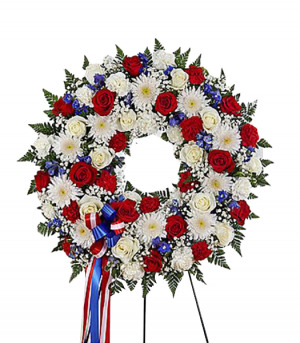 Many family members and friends loved to help with floral arrangements, but don't have the information prior to the service. 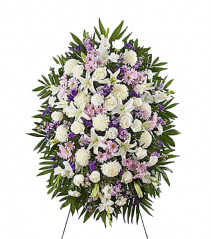 This is why we offer same-day funeral delivery. Many work with us days or even hours before a service. 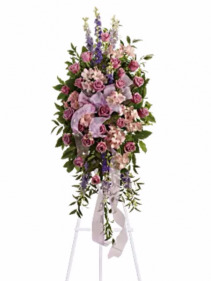 Our shop is staffed with talented and precise floral designers who can tackle the job. Never send flowers late to a funeral with our same-day delivery. 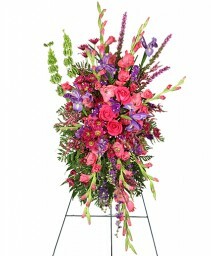 The goal is to place an order days or even weeks before the service. 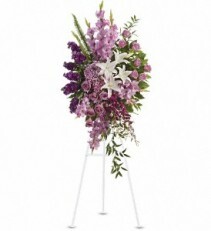 While that may not be the case, we will stil provide excellent service with any time given and without a comprimise on quality. Please place your order before 2:30 PM, Monday - Friday, or by 12:00 PM on Saturday and we can deliver flowers on that very same day. 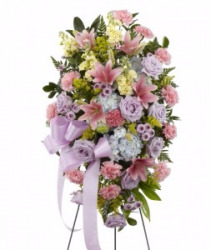 All we need is the delivery information from your address book!